Are you guys sick of this series yet? Do you still like seeing what’s in everyone else’s purse all the time? Let me know, and I’ll change things accordingly. I still have a healthy lineup of purses, but if you still like it, still want more of it, submit away. 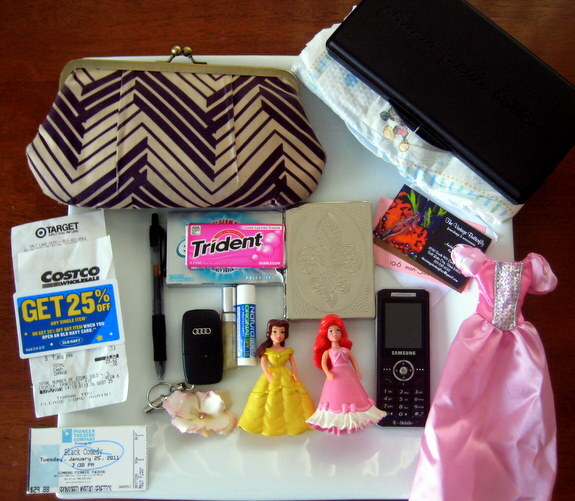 This week’s What’s In Your Purse series purse is from Jen of Organized Design. 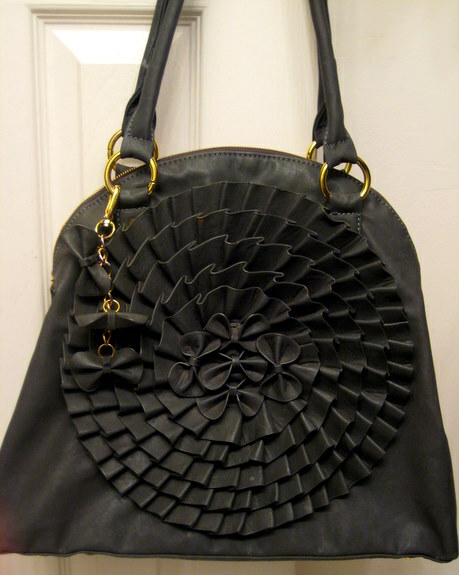 I really like these cool flower purses I’m still seeing everywhere, even though I don’t own one myself. My wallet. Although technically it’s a clutch that I got from Old Navy 8 years ago. It holds all my cards, cash, check book, and coupons. I don’t know what I’ll do when the life is out of it. It has been my all time favorite! Ariel and Belle, of course! And last but not least my design business cards! Love this feature! Keep the purses coming. I’m always wondering what other ladies keep in their handbags and if I’m a freak for carrying nine colors of Sharpies and a flashlight in mine. I love this series. Please keep those purses coming! I like the purse series, too! I actually really like seeing how everyone organizes their purse content for the photos, as well as what all everyone else carries around with them. I love this, and look forward to it every week, please keep it up! i very much enjoy this series! !